Guests will find PGA National Turkey Antalya Golf Club’s two golf courses in better condition than ever this year following a €1 million resort investment in new course and greenkeeping machinery. 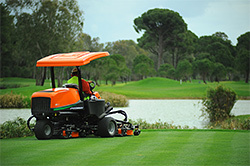 Turkey’s premier golfing venue – which boasts two 18-hole championship layouts, PGA Sultan and The Pasha – has further cemented its position among Europe’s elite golf resorts by carrying out a full upgrade of its fleet of Ransomes Jacobsen green, fairway and tee mowers. In addition to investing in 18 new green and tee hand mowers, PGA National Turkey’s expert team of greenkeepers will benefit from using Ransomes Jacobsen’s latest range of rough, fairway, fringe and top-dressing equipment to keep the courses in pristine condition. The number of rounds played at the resort rose by almost 95 per cent to 63,000 in 2018 and, with bookings already up by 15 per cent this year, PGA National Turkey is forecasting another record-breaking 12 months. Michael Jones, director of golf at PGA National Turkey Antalya Golf Club, said: “With the number of rounds being played at the resort increasing with every year, it’s imperative that the resort invests in the latest machinery to cope with the growing demand. Situated 25 minutes from Antalya, PGA National Turkey Antalya Golf Club’s outstanding facilities include two 18-hole golf courses and two luxury hotels – the 176-room luxury five-star Kempinski Hotel The Dome and the five-star, 442-room, Sirene Belek Hotel, which underwent a €2m room refurbishment programme over the winter. High-resolution images of the PGA National Turkey Antalya Golf Club may be downloaded for editorial purposes by clicking here. The first golf resort in Turkey to feature 36 holes and having played host to some of the biggest names in the game, the PGA National Turkey Antalya Golf Club is regarded as one of Europe’s premier golfing venues. Situated across 1,350 acres in Belek in the heart of the Turkish golf Riviera, the resort features outstanding facilities including two 18-hole golf courses – the PGA Sultan and The Pasha – two five-star hotels and an extensive range of sports and lifestyle amenities. The host of numerous high-profile tournaments including the 2012 Turkish Airlines World Golf Final – which featured the likes of Tiger Woods, Rory McIlroy and eventual winner Justin Rose – the resort raised its global profile further in 2017 by joining the select group of courses to receive the official endorsement of The Professional Golfers’ Association, being renamed as the PGA National Turkey. Opened in 2003, the par-71 PGA Sultan course measures 6,477m from the back tees and players must negotiate a number of hazards to score well on the narrow, challenging layout, including no fewer than 12 lakes and 122 bunkers. The Pasha, which was also designed by David Jones in association with European Golf Design, is wider and more inviting as it meanders through a mixture of towering pine trees and woodland. Complementing the golf courses are extensive practice facilities while, under the terms of its partnership, The PGA will oversee a significant upgrade of the resort’s golf academy in 2018, adding radar ball-tracking, video analysis and custom club-fitting facilities to the existing 300-metre driving range and associated short game area. Located less than 30 minutes from Antalya international airport, the PGA National Turkey features two outstanding hotels – the 176-room luxury five-star Kempinski Hotel The Dome and the 442-room five-star Sirene Belek Hotel, both offering luxury accommodation on an all-inclusive basis. As well as offering access to an extensive array of other sports and leisure facilities including tennis, football, numerous swimming pools and watersports, a water park, kids’ clubs, and two luxury spas, hotel guests can experience an array of opulent culinary experiences at the resort’s variety of bars and restaurants.